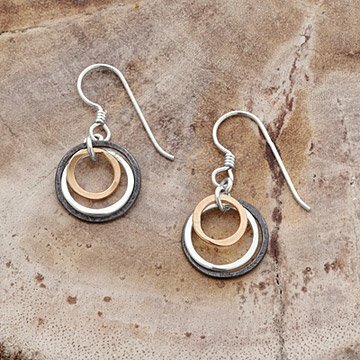 Simple and and stylish, this trio of circles represents the passage of time in past, present, and future. We all live in a fleeting, invisible moment called "the present." Not only is now the time for us to take action, it also serves as a link between our warm, fading memories of the past, and the shining hope for the future. Jewelry artist Beth Lawrence captures this passage of time in the Past Present Future jewelry suite. Each one has three interlocking circles: a muted, oxidized ring represents the past; a sterling silver ring wrapped with a band of silver wire captures the present; and a shimmering, gold filled ring represents the future. The three rings are held in place by sterling silver earring wires. More than just elegant accessories, the pieces in this collection offer a constant reminder to live in the moment. Included is a card explaining the jewelry's symbolism. Handmade in Nashville, Tennessee. Make it a set! Click here to see the matching necklace. Loved the earrings and the sentiment behind them. I was glad a little business card came with the sentiment written out! Perfect for my gift. However, wouldn't buy again because the packaging was way too much for the size of the product. The package (for earrings mind you) did not even fit in my mailbox!!! Unfortunately this overshadowed the purchase. I have worn these every day since I got them. I absolutely love them. Every time I wear them I think about my future :-) and whenever someone comments on them I always tell them the idea behind them. I've had a lot of compliments. She loved the earrings and meaning behind them. She wears the necklace and earrings daily. Loves the meaning they express. As other reviewers have commented, these earrings are very very small. Why not increase their size a bit to make more of a statement? Again, I feel that these are well-suited for a tween/young girl or perhaps someone that likes very small, discrete earrings. I'm debating whether to exchange the earrings. They are very pretty and well-made. But they are just a lot smaller than I thought from the photo and the measurements listed on the website. I wear these to work often and get lots of compliments on them. These earrings are a beautiful reminder to be mindful of our lives. The past, present and future existing simultaneously in this moment. I love the meaning behind these earrings as well as the look and quality.